Interior of architect Augustus Welby Pugin's Peers' Library at the Houses of Parliament, London. 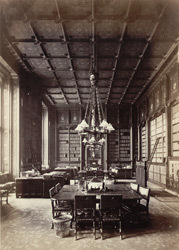 "The Peers' Libraries form a magnificent Suite of Apartments, replete with everything that may minister to the comfort and convenience of those for whose use they are designed. Every portion is complete and harmonious, even the most subordinate articles of furniture having been designed and manufactured in strict accordance with the architecture. The walls are completely lined with bookshelves in dark oak - the whole surmounted by a frieze, the panels of which bear the armorial bearings of the Chief Justices of England, arranged according to date. The ceiling is panelled and elaborately painted."